His neighbors said, “I'm so sorry. This is such bad news. You must be so upset." His neighbors said, “Congratulations! This is such good news. You must be so happy!" One of the wild horses kicked the man's only son, breaking both his legs." -- Taoist Fable, Author Unknown. 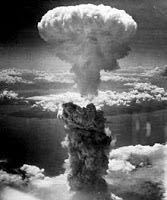 On August 6, 1946, the United States dropped the first of two atomic bombs on the country of Japan. At 2:45 AM on this day, the Enola Gay, a B-29 Bomber, took off from Tinian, an island in the North Pacific, 1,500 miles south of Japan. At 8:15 AM, the Enola Gay's bomb doors were opened, and "Little Boy" was dropped on its target, Hiroshima. Two thirds of Hiroshima was destroyed. Smoke and fire engulfed the city. 60,000 buildings were demolished. 70,000 people died immediately, another 70,000 died from radiation exposure over the next 5 years. While devastating, Japan did not surrender. A painstaking and deliberate decision was made by President Truman; detonate a second bomb -- Fat Man. On August 9, 1945, my father's 11th birthday, Fat Man was dropped on Nagasaki at 11:02 AM. While Fat Man was a much larger bomb than Little Boy, "only" 40,000 people were immediately killed (and thousands more died of radiation sickness in the coming years). On August 15, 1945 at 12 Noon, Emperor Hirohito announced the Japan's surrender in a radio broadcast. Further, perhaps more devastating was his renunciation of divinity and status of "supreme being" and "god status." The core of Japanese belief systems was shattered. On that day, Hidekichi, my father, crouched outside his schoolhouse just outside of Tokyo with his fellow students, perhaps 200 in total. The schoolmaster turned on a radio to the Emperor's broadcast and awaited his message. Some of the younger children frolicked and played, unaware of what had just happened. Older children sat in silence or murmured quietly among themselves. They knew of the devastation of the War, especially over the last few days. The bombings in Hiroshima and Nagasaki were incomprehensible, but all knew of the fires, destructions, deaths -- the horror. The radio was connected to the speaker system. Crackly static was followed by an ear-piercing screech from feedback. Static turned to silence, as the radio tuned in. Silence also overcame the school ground. This was probably the first time the Emperor had spoken to the common people; it was likely the first time his voice would be heard. The transmission signal was weak. The words were hard to understand; it was delivered in formal classical Japanese, inaccessible to most commoners. The message was equally confusing; even if the words could be understood, it was unclear what Hirohito had said. Many were uncertain what had just happened. Hidekichi listened in shock and sorrow. His devotion to the Emperor and Japan was typical and atypical. Like most, his formerly unwavering allegiance to both was shaken. Patriotic and loyal, he gave unconditional support to Hirohito and Japan. The deciphered meaning of the message, regardless of the general confusion, was clear to him. Japan was destroyed and at the mercy of America. Japan would be under rule of the new Western Superpower. Hirohito's immediate transformation from divinity to mortal status was more incomprehensible than the devastation of the War itself. Hidekichi's life in Japan would be forever different. That said, he contemplated a different life. Having been born and spending his first 5 years in the United States, he knew he had options -- options unavailable to his schoolmates -- because he held an American passport. While memories of the past were viewed through the lens of young childhood, he knew of the possibilities in a land called "America." Japan of the past was gone, its future uncertain. But in America, the future would be prosperous. To the victor goes the spoils. His life would be different. At eleven years old, it was unclear how. But America was his destiny. Several miles away from the schoolhouse at his Tokyo home, Kanekichi, contemplated and reflected; He listened solemnly and calmly, with little emotion. While not an educated man, he knew what has happened. While his allegiance to Japan was also unwavering, he also knew the future of the country was uncertain. Like his son, he was a man of determination -- self-determination. Regardless of the circumstance of his country, he would control his own destiny. Unlike his son, though, he did not have the option of returning to America. He had spent nearly two decades in America prior to the beginning of the War. Coming to America, he pursued the "American Dream" while remaining a Japanese loyalist. Like many, he worked hard, accomplished much, and returned much back to the homeland. His intentions were not so much to return to Japan himself, but circumstances dictated that he do so in 1939. He evaluated his doing in what had become. Without apology, he acknowledged his role and his life in what has happened. Maybe not surprisingly, he was unafraid of what would happen next. Staring in the eyes of Justice, he knew there would be a day when many would stand trial among the defeated. "War crimes." He awaited that day for himself; that day never came. "This is what I have done. I'd do it again." These words would never be repeated.